Departement of Vaucluse - Pop. 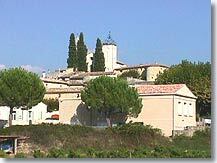 : 800 h.
Situated 3 km north-east of Vaison-la-Romaine via the D71. 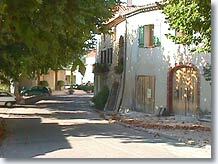 The village of Saint Romain en Viennois is on the left bank of the Lauzon river, just 5 minutes from Vaison la Romaine. It clings to the hillside, and turns its back on Mont Ventoux. After leaving your car in the car park by the mairie, you'll discover the village on foot, strolling through its narrow streets. 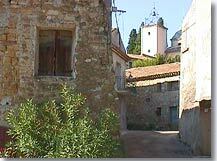 The village is encircled by a pleasant walkway lined with plane trees and hazelnut trees. Saint Romain doesn't have any ancient monuments apart from the remains of the ramparts and its chuch, which you will discover as you walk along the Grand Rue. The main activity in Saint Romain is agriculture. 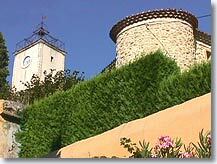 The locals produce an excellent Cotes du Rhone wine, and a delicious olive oil... you must try them! The village centre just has houses and one small bar on the Avenue de Verdun, which passes through the lower part of the village. 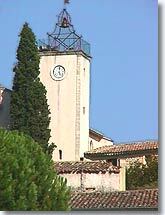 You can do your shopping at Vaison-la-Romaine which isn't far away at all, and meanwhile enjoy the many walks that will enable you to appreciate the natural environment and all the charms of the countryside surrounding the village. Tennis, walking and mountain biking. Puyméras (3km), Faucon (3 km), Vaison-la-Romaine (3 km).